Acer is a brand which is known for manufacturing quality Windows PC. From desktops, All-in-One PC, laptops to Chrome OS PCs, Acer manufactures the best devices at a reasonable range. With its hi-fi speakers and full HD displays, it enables you to enjoy an immersive cinematic experience. It also features convenient cable management slots which help in keeping your desks clean and organizing your PC cables. But as this is an electronic gadget, with continuous usage, it is often presents some technical setbacks which affect the functionality of your desktop. A very frequently occurring problem is the freezing of the Acer desktop screen. If you are looking for the perfect Acer desktop screen freeze solution, keep reading this blog to know the essentials. Also, get in touch with the experts at UAE Technician for further assistance. Overheating- If your computer overheats, then it will crash or freeze for some time. This issue occurs when the CPU is used too heavily for a longer period of time either for watching movies or playing games or when dust or debris get accumulated inside the cooling fan of your CPU. Hardware problems- When your computer freezes periodically or crashes very often, it is a sign of an impending failure. This might result in some problems in the hardware components, particularly related to the drivers. Malware problems- If your computer is affected by malware, then it might freeze. But freezing related to malware is limited to a single program and it stops only certain functionalities. The blue screen of death is one of the results of malware affected computer. If your computer starts up fine, then it will back up all your data immediately and you can use it as before until it freezes up again. Just after you have restarted your computer, it might display an error with Windows and will ask whether you want to start normally or in Safe mode. You can choose to start Windows normally. If it again freezes, then you should choose to boot in “Safe mode with Networking” the next time. 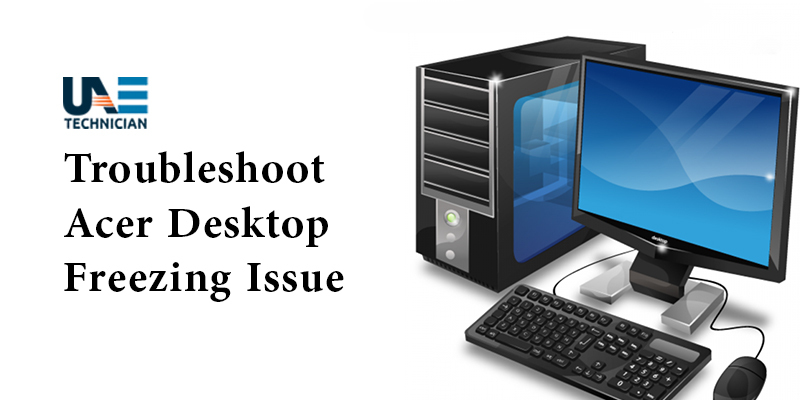 After performing the booting process, if the computer freezes again either in Normal mode or in Safe Mode, then undoubtedly there is a critical hardware or software problem. Depending on the cause, there are two types of troubleshooting solutions that you can try- software related and hardware related. Your Acer desktop might occasionally freeze due to any program. To solve this, you should open the Windows Task Manager and select the ‘Performance Tab’. There, you can find the memory, disk and CPU categories. If you find any of them really high, then that is causing the issue. Therefore, you have to shortlist and uninstall or update the program. During start-up, if the computer freezes, then the corruption in the Windows is responsible, or there is any hardware issue. For more in-depth hardware troubleshooting of your Acer desktop, you can take help of a diagnostic CD like FalconFour’s Ultimate Boot CD. Apart from these, there are plenty of other tools available to check out the functionality of other computer parts. Place a call at our helpline number 042053349 and share the issues of your Acer desktop with our experts at UAE Technician. They will offer you the perfect Acer desktop screen freeze solution at a pocket-friendly price within a short span. You can drop a mail to us mentioning your queries and receive solutions from our end within the next 24 hours. You can also chat with our experts in real-time by connecting with them over our live chat window during busy working hours and avail instant solutions to resolve the freezing issues of your Acer desktop.